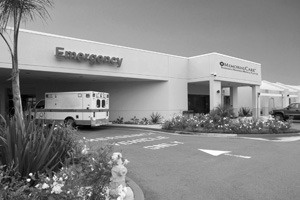 The ER at Saddleback Memorial – San Clemente.At one time or another, most of us have been to the Emergency Room, heard a story about an experience at the ER or at least seen it on television. A visit to the Emergency Room does not have to be a stressful or frightening experience. With the right information you can reduce anxiety and have a positive experience. Here are some guidelines to know when to come to the ER as well as tips for making your visit less stressful. If you experience any of the symptoms, you should call 911 immediately. It’s always better to be safe than sorry. If you are in doubt, call 911. Also, it’s important to know that for certain conditions, such as a heart attack or stroke, it is essential to call 911 because paramedics can deliver life-saving care en route to the hospital. Karen Sharp, Manager of the Emergency Department at Saddleback Memorial - San Clemente has worked in emergency services for more than 25 years. During this time she has observed that whenever possible it is a good idea to bring someone else with you to the ER. “If your condition is serious, you may need someone to help provide information and communicate with staff,” says Sharp. Marc Taub, MD and Karen Sharp, Manager of the ER at Saddleback Memorial. According to many health care professionals, it is important that people be prepared with all of their health information. “When people come into the ER and have all their information handy, it makes the registration process a less stressful event,” says Sharp. You will also want to make sure you answer all questions from the medical staff to the best of your ability. Knowing all the facts helps health professionals make a complete diagnosis and a treatment based on the information that you give them. Let the nurses or other staff know if there are any changes in the way you are feeling.